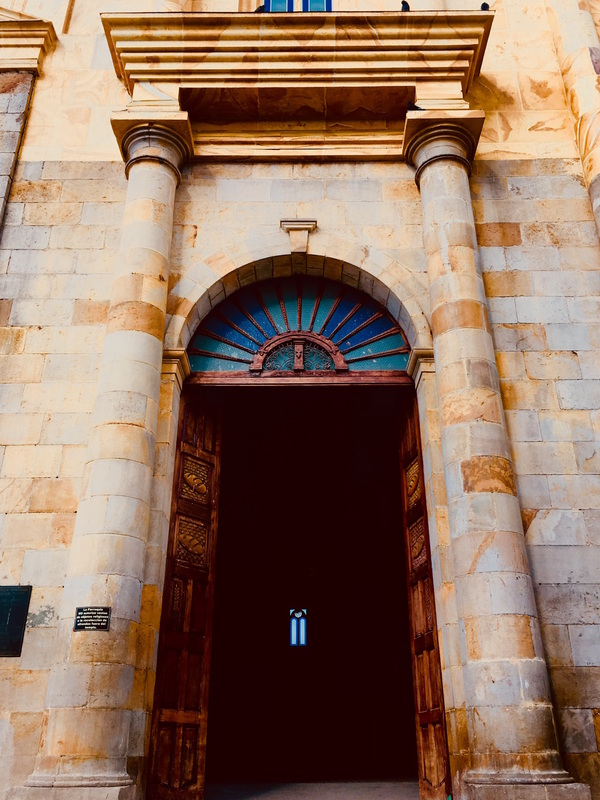 While I spend most of my time in Bogotá between my husband’s relatives and my family, we also spend at least a week in a little “pueblo” called La Mesa. It’s about 90 minutes or less away from Bogotá. The change from the city to be in the middle of mountains with warmer weather is amazing. This year we were there for over a week with a lot of family. Most of my cousins, aunts and uncles were there and we also celebrated my grandma’s 80th birthday. If you were following me on Instagram (@theunbosom) in the middle of January you may have caught a glimpse of it. There are so many things you can do while there. 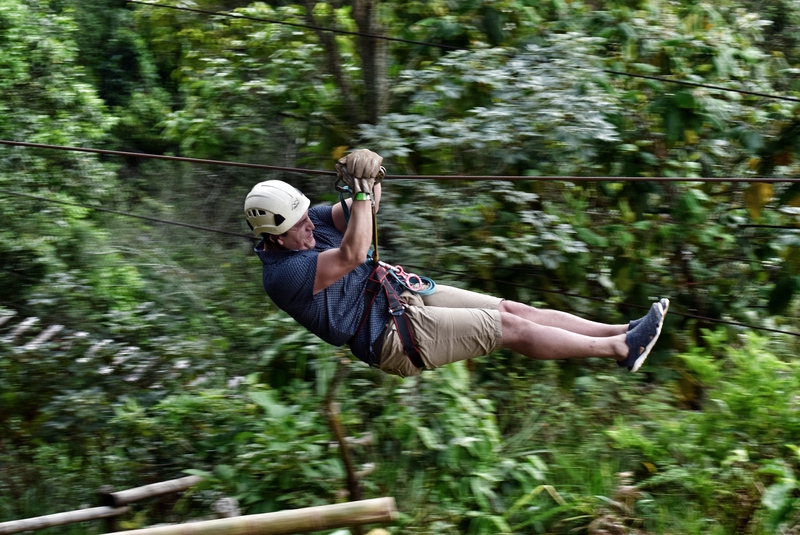 There’s great food, a charming small town to take an afternoon stroll and one thing I had never done before but it’s totally worth it: some extreme sports. 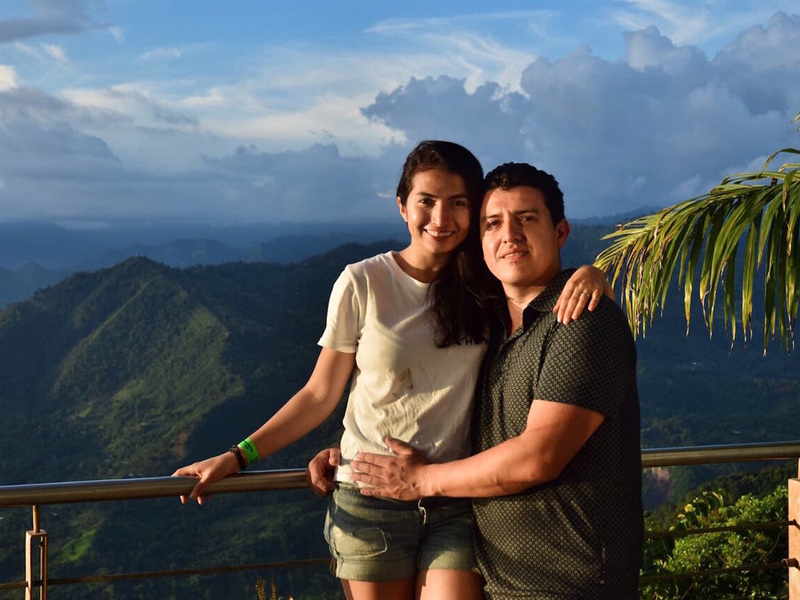 Our wedding anniversary always falls during our stay in Colombia, this year we made it to 8 years. And even though we had our fancy dinner while in Bogotá, I told my husband I wanted to do something that took us out of the category of “exhausted parents of two little ones” for a little bit. My dad has had a weekend house in this town for over 11 years and I had always noticed this nature park with extreme sports. Well, it was time to do it. I did have to convince my husband though, who at the end said ‘yes’ because he got tired of me insisting. Ten years of putting up with him must count for something right? Just kidding. It’s mutual patience. 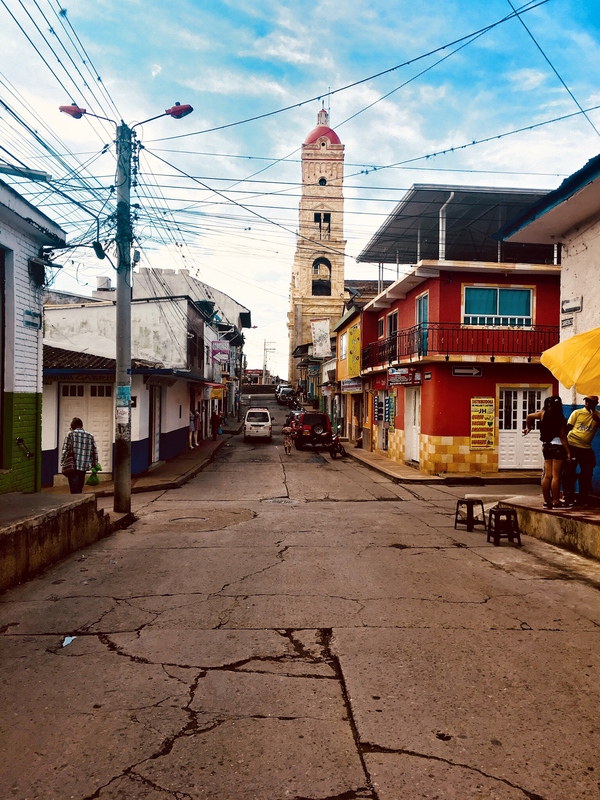 So before I show you how amazing our experience was I’ll give you a little tour around the town of La Mesa, Cundinamarca, starting with the road that leads you to it. Why? Because there you’ll find the most delicious Colombian food! If you’re going to La Mesa you must stop and eat at Rancho de Jairo. 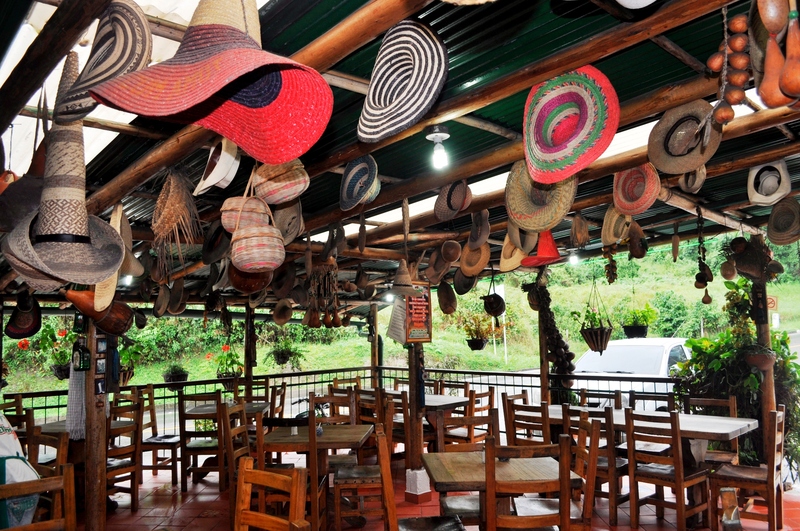 Rancho de Jairo is an authentic Colombian food restaurant focusing mostly on the Coffee region of the country’s dishes. They actually have two locations, one midway to La Mesa from Bogotá and the other one 5 minutes before getting to the park. You’ll find the most authentic decor and the food is so good. If you’re coming for breakfast you can get any fresh fruit juice of your choice with a corn patty stuffed with fresh shredded cheese. Now if it’s for lunch there’s a lot to choose from but you can never go wrong with a “Bandeja Paisa” it’s a huge dish, so if you don’t eat that much you can order half. Other things I like to order are the patacones with hogao, or for something lighter just a steak with arepa. If you want to get a taste of everything get a picada. There’s not a time I don’t stop on the road to get these before going to my Dad’s weekend house. Yes, in Colombia there’s such thing as stopping wherever on the road to get food. It’s the most amazing thing. So these arepas are in a food cart right outside my favorite popsicle place. You’ll find them midway from the second Rancho de Jairo to the park on the right side of the road. It’s this little green store named “El Palacio del coco”. So sorry I didn’t think of taking a picture for reference. Will tell my dad to get one for me when he goes. 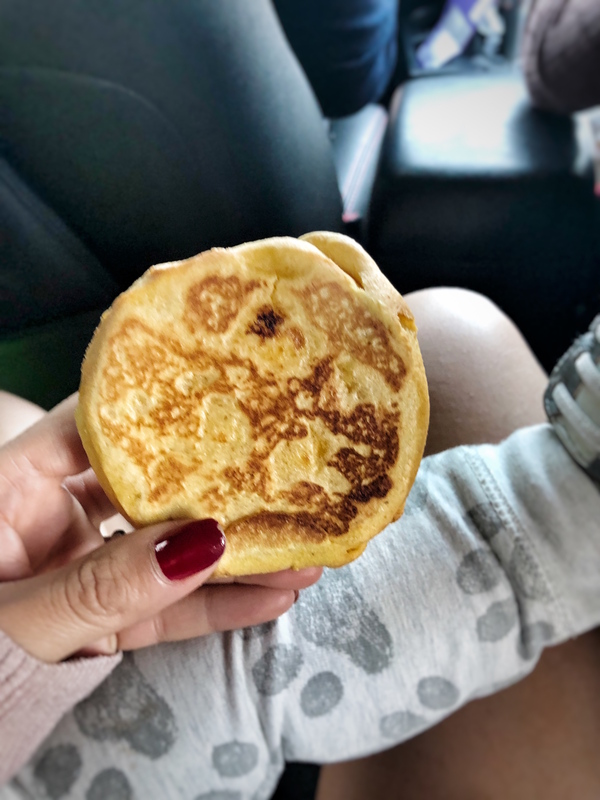 The arepas are filled with cheese and you won’t find them anywhere else. I always buy some to bring back to Bogotá and my dad will bring me some when he comes for his business trips. (I freeze them haha) You’ll find them midway from the second Rancho de Jairo to the park. Look for this little green store named “El Palacio del coco” they have the most delicious coconut popsicles. They are even sweetened with stevia for those health conscious. My favorite is the coconut one, but the maracuya, or queso con bocadillo are to die for too. The park with the extreme sports (keep reading) has its own restaurant and it’s good. They thought it really well because after hours of being in the forest of course you will be starving. They specialize in very thin fried plantains topped with whatever you want. Shredded chicken, beef, cheese, ham among others. If you can make it to Rancho de Jairo, I would do it. All these little towns in Colombia are exactly the same. They’re made up of one or two long commerce streets, the central square of the town and the church. But there’s just something magical about walking through these colonial small towns. We love to do it in the late afternoon. If it’s a holiday weekend you’ll most likely find fairs in the central square with gorgeous hand crafted jewelry, clothing, souvenirs and food. 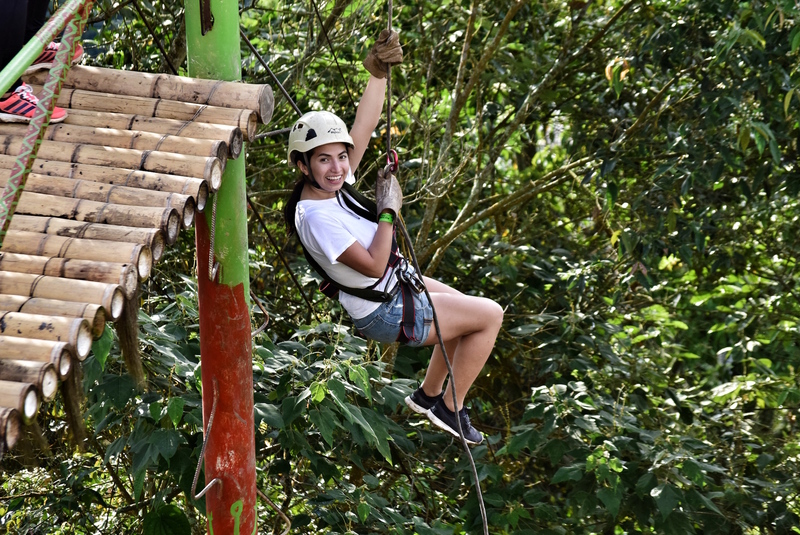 There are two extreme sports parks in the area, however I’ve only had experience with one: Macadamia Bosque Aventura. 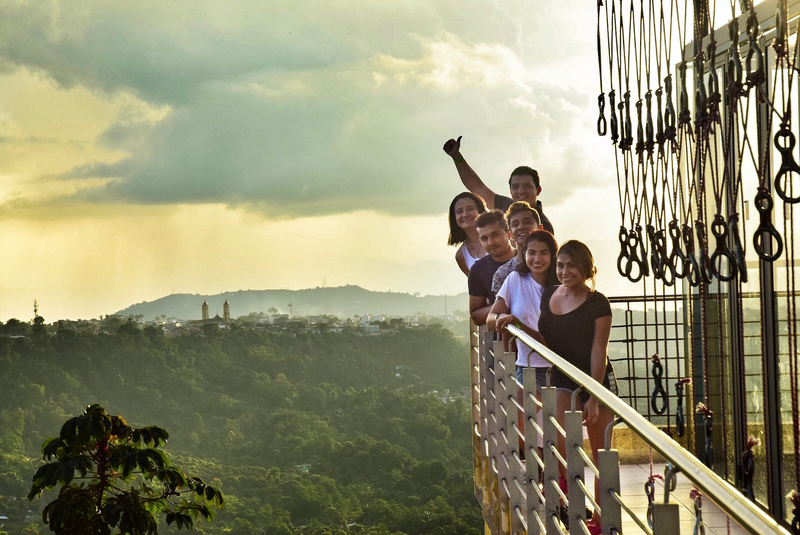 Here you can do rapelling, hiking, zip-lining among other things. It’s easy to get to since you’ll see the big billboard just five minutes before getting the town of La Mesa. Parking is right there and it’s free. They also have their own restaurant (Macademia Restaurant) as I mentioned before with delicious food. Since I wasn’t 100% sure my husband would actually do it (at one point he said: “I’ll just come with you and watch you do it”) I decided to recruit my younger sister and some cousins to come with us..but of course he ended up doing it anyway. We drove out to the road and within 5 minutes we were there. We were greeted by a friendly guy who watches the cars and he took us to one of the guides. You should know everybody is incredibly friendly. Then we were presented with different plans. There’s one for everybody depending on how long you want to be there and how many activities you want to do. We went for the shorter plan of 1-2 hours because our visit was very spur of the moment and we went late. I also had to come back to put my baby down for the night. However, I totally recommend to go for the whole thing. I think is called “Pa no olvidar” translated into english “to never forget” and lasts about 6 hours. 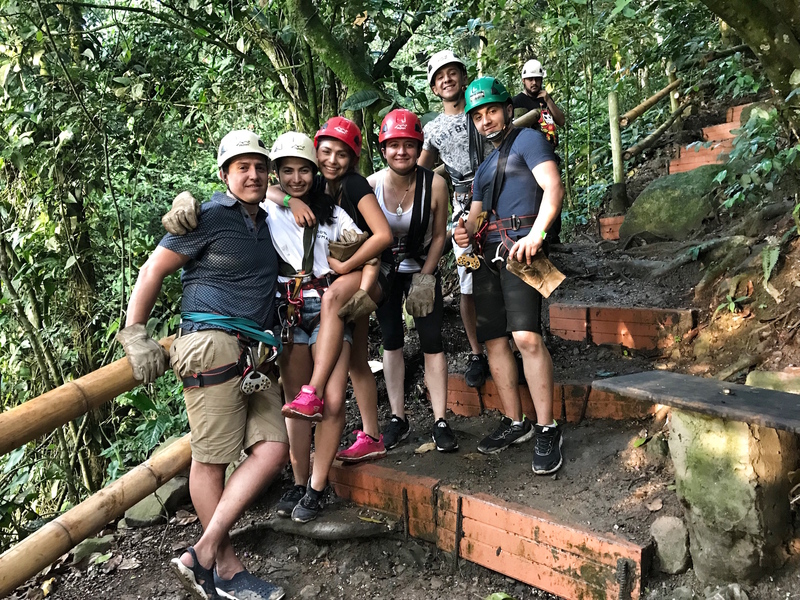 It includes canopy, rapelling, a bat cave, a rope bridge, canyoning and some fun challenges in water and mud. There are more plans in between to accommodate to every preference. I was trying not to look down!!! But I can’t wait to do it again! Side note: It’s better to wear leggings to cover your legs from mosquitoes and branches. Also don’t wear your favorite white tee. I have no idea what I was thinking. Otherwise I LOVE my shorts and tee. Knowing that I wanted to write about this destination, I asked if this was family friendly. And yes it is! It’s great for kids 5 years and up. That took me by surprise because this tired mom got scared at certain points, but the guide assured me kids love it and they do everything with a guide. I will definitely try it next time when my oldest turns 5. I know Shana, Mike and the kids would have a blast here. She inspires me so much to travel with my kids. Don’t forget to stop for a pic! 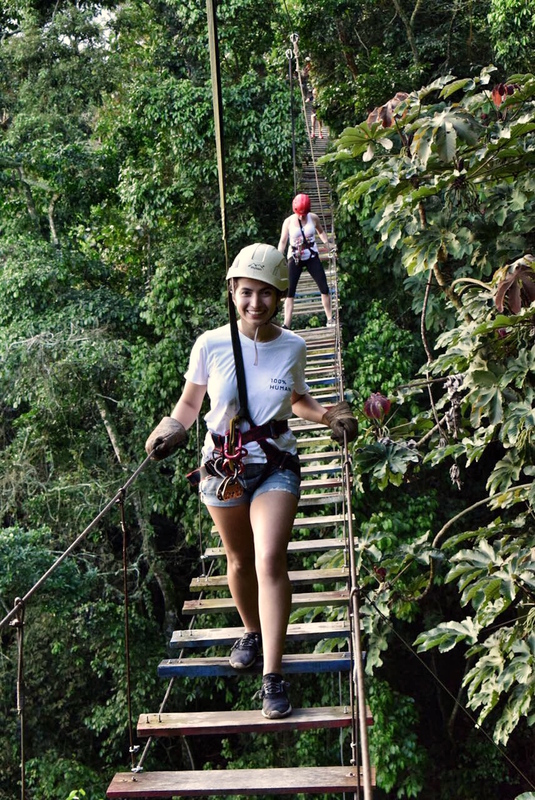 There are some guides in specific places at Macademia Bosque Aventura to take pictures of you doing every activity. They will get your email and send you a link the following day. It only costs $15.00 Colombian pesos (around $5 US). Then by the end of the trip don’t forget the pictures with this view of the mountains once you don’t have all that gear on. Breathtaking! While you could totally go back to Bogotá on the same day, I think it would be nice to spend a night there. I wanted to skip this section because I don’t really have experience with hotels in the area, but I know you can rent houses either in La Mesa or Anapoima (the next town over) and by looking on Trip Advisor I saw some cute hotels to stay. There’s another option (as long as the whole TME readership doesn’t go at the same time haha) My dad has two small cottages he sometimes rents. If you find yourself over there or planning to go I might be able to find something for you. It’s only 5 minutes off the road and a total paradise. I hope you make this stop whenever you’re visiting Bogotá. It’s so close and an amazing experience! Have you done this kind of extreme sports before? Would you do it with your 5-year-old? Photo Credit: Cesar Alejandro Uribe Tovar – CAUT for the pic at El Rancho de Jairo and Stephany Duque (my niece) for the ones of the town of La mesa. Come and let’s hang at at my favorite place: Instagram! 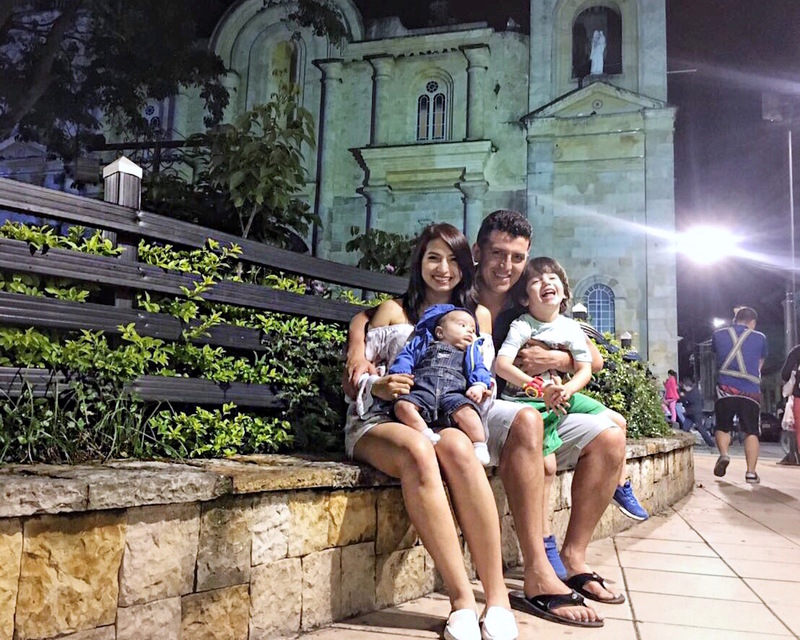 (@theunbosom) for more of this Colombian mom raising two kids away from home and family. More style and just real life. I’m a fan of being raw and vulnerable on social media. Previous ArticleThis is the Easiest Warm Weather Uniform..EVER. Love: keeping it real, athleisure and hiding my mommy tummy under high rise jeans 📍NY from Colombia If you can't find me in the bathroom hiding from my two boys, I'll be showing a mix of style, vulnerability and real life on Instagram (@julietatorresd) Would love for you to join me there! I loved going on this adventure with you, thank you! The snacks looks sooo good! Some day some day…. I really like extreme sports like this. Thank you for sharing! It looks great! My family has been here last year. It was a perfect leisure for us. 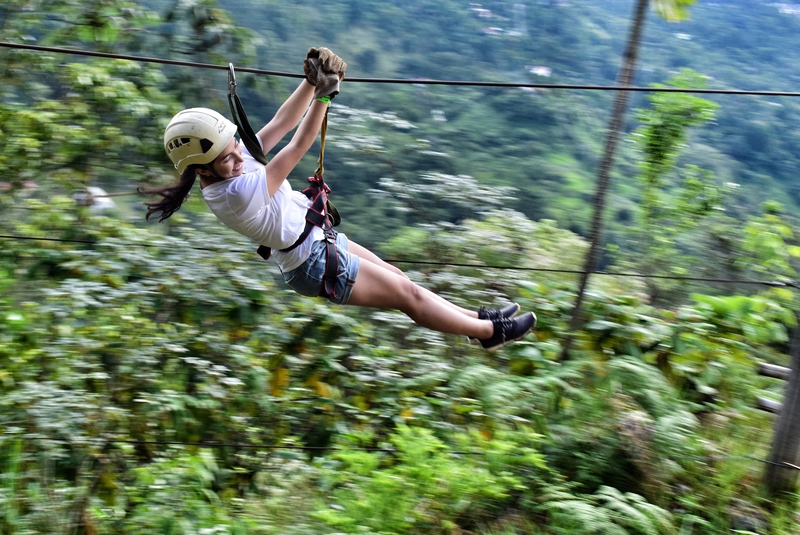 That time I was freelancing for the service https://familyessay.org/college-papers/ and couldn`t go zip lining with my husband and a daughter but still I was happy for their wonderful day in Macadamia Bosque Aventura. Next time I will definitely join them.